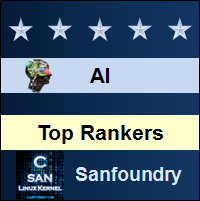 Here is the list of "Top Rankers in Artificial Intelligence" skill, who has shown an outstanding performance in "Artificial Intelligence Certification Test" from Sanfoundry and have scored either Grade A* (Genius) or A (Excellent) and earned a "Certificate of Merit" for themselves. Certification on Artificial Intelligence is substantially useful for everyone in their Professional Career growth. They can readily showcase their certified skill on Artificial Intelligence topic during job interviews, career discussions and career progressions. We have also listed down the names of all the people who have taken our Artificial Intelligence Certification Test and have passed the test. So, scroll down the list below and check your position. The list is arranged in descending order of overall marks obtained by the candidate in the test. In case you would like to attempt all types of tests (Practice Tests, Mock Test) or read 1000 Questions on this topic, you can start here or here respectively. Here’s the feedback from Top Rankers in Artificial Intelligence. It was really a great experience altogether to participate in the Sanfoundry Certification Test. I have Artificial Intelligence in my course curriculum this semester. I followed a book by Russell & Norvig and practiced from the Sanfoundry Mock Tests, Practice Tests too. Sanfoundry Artificial Intelligence certification is highly valuable to me as it will not only boost my CV but also increase my confidence, uplift my career if I take up AI in Masters. Sanfoundry certificate will help me to apply for various scholarship programs that are available for AI worldwide.